Tail Gate Down? Ford F150, Ram Truck or Chevy Silverado . . . Whether it's a Ford F150, RamTruck or a Chevy Silverado - which Is More Fuel Efficient, Driving With A Pickup's Tailgate Up Or Down? Should you drive with your pickup truck's tailgate up or down? It's an age-old controversy that's divided drivers for decades. Traditionalists will swear you should leave the tailgate down. Makes sense, right? It would seem to let the air flow more cleanly over the body and through the bed. But there's also a school of thought that argues trucks are designed to look and operate in a specific manner, and modern design techniques can help channel the airflow properly. So don't mess with all of that: Leave the tailgate up. Wondering which is true? To solve this tailgate debate, we went inside the wind tunnel at Ford to test the aerodynamics of the 2015 Ford F-150. The model's exterior design manager Brad Richards explained that the new truck was designed with purposeful edges and shapes that look imposing, yet still allow the F-150 to maintain strong aerodynamics. "We think this is the toughest F-150 by far, but also the most efficient," Richards said. All of this matters, as loyal Ford truck buyers expect the F-150 to look a certain way, but the Blue Oval is also projecting fuel economy gains thanks to the new truck's use of lightweight aluminum. And no matter how light the truck is, fuel-economy gains could be wiped out with poor aerodynamics. With that in mind, Ford styled the truck to maintain its beefy look, but also beat its predecessor in the wind tunnel. Ford paid close attention to a new, lower air dam, mirrors that were redesigned "a dozen times" and a small lip on the rear tailgate. Acting as a spoiler, the lip allows air to cleanly detach from the body. Thanks to the smoke wand in the wind tunnel, you can actually see the difference tailgate up versus tailgate down in our video below. 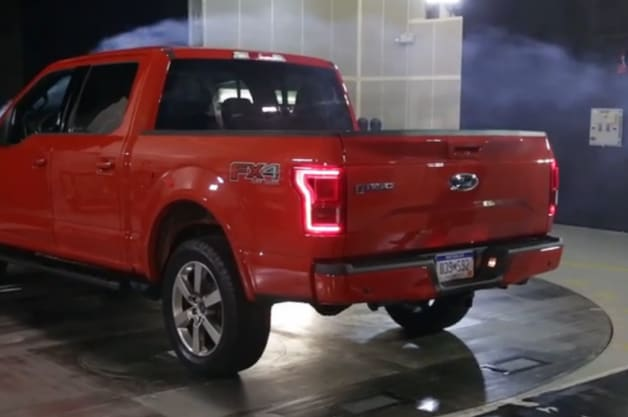 Ford remains tight-lipped about the F-150's fuel economy numbers, but it admits dropping the tailgate wouldincrease drag by about eight per cent – and sandbag fuel economy. Even for older models without the fancy spoiler, you're hurting efficiency and lowering your gas mileage when driving with the tailgate down, argues Richards. So there's your verdict, straight from the wind tunnel: Leave the tailgate up.